Budapest marked our first non-euro city, and you know what that means? It meant that for the first time since setting foot on this continent, we didn’t have to worry so much over how much were spending over food. For the first time, both of us could get a drink at dinner, without having to share or go without. And dessert is on the table once again! I realize I haven’t done a Foodie Friday post in quiet some time, and that’s most likely because we’ve mainly lived off of doner kebabs. I assure you I’m not exaggerating when I say that we had one at least once a day in Western Europe. We started to jokingly call it “the kebab tour of Europe”. Yeah… not very exciting things to talk about. But still, Budapest marked the turning point of where we could eat exciting food once again! And Hungarian food turned out to be very exciting! 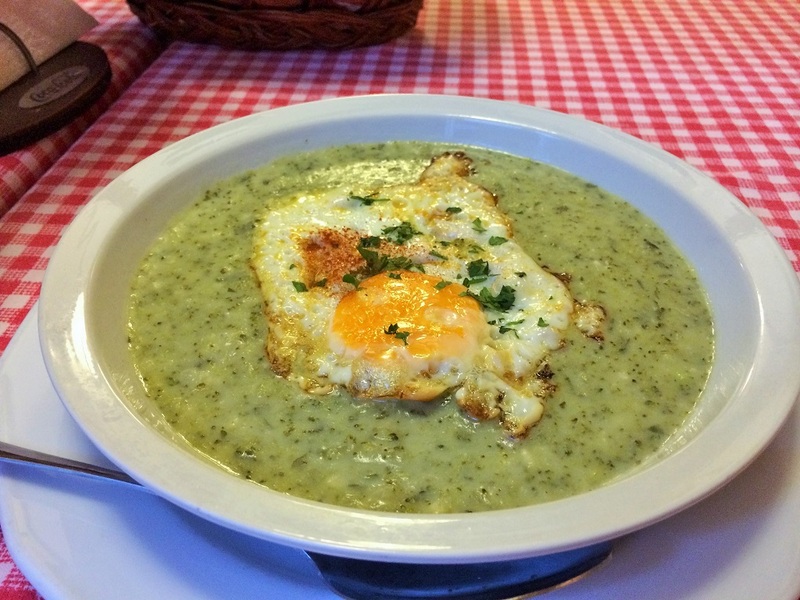 We ate Hungarian cuisine everyday, revisiting our favorite places daily. 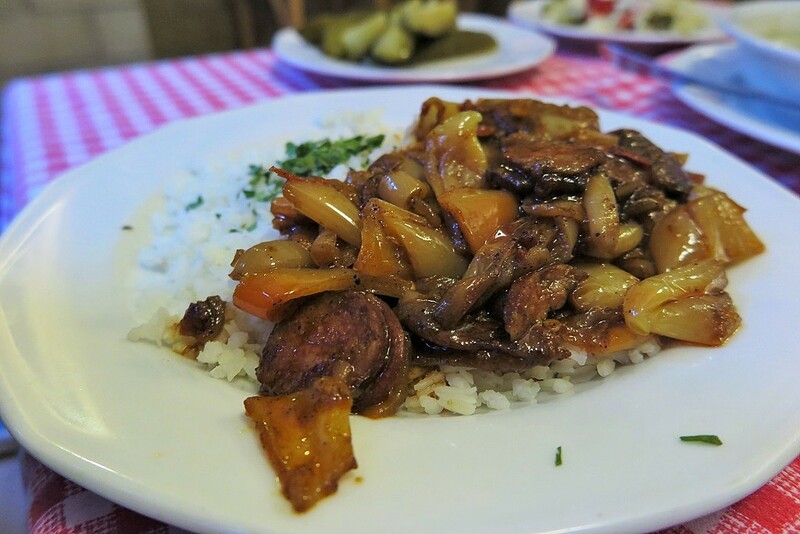 I want to share our 2 favorite places we found for delicious Hungarian dishes, as well as tell you about some traditional cuisine that is NOT goulash! This little eatery is in the town center on the popular Oktober 6 street (or what we call Restaurant Row). We ate there for lunch our first day in the city, and loved it enough to return that very night.. also bringing D’s cousin with us! And then we returned a couple more times after that. We especially loved dining outside at the red and white checkered tables. The waiter is also one of the friendliest people we met in Budapest! 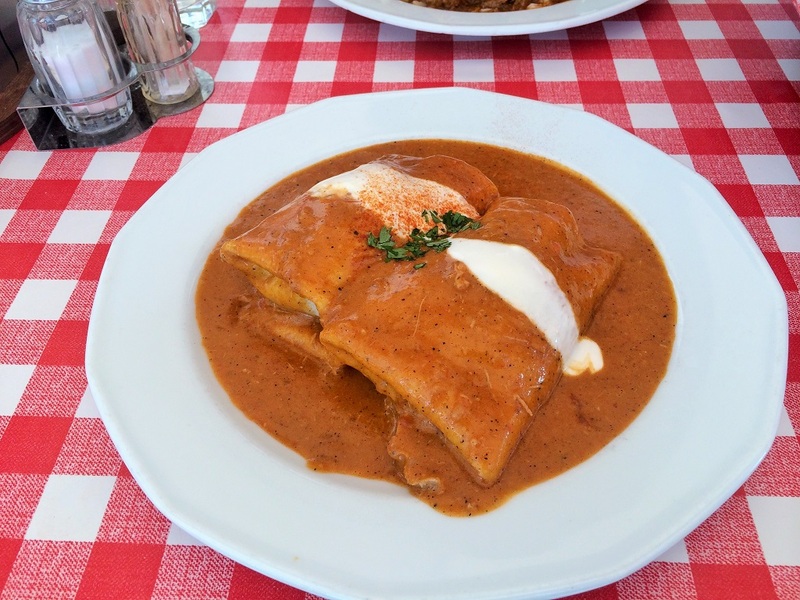 Stuffed crepes – shredded meat wrapped in thin crepe skin, drizzled with sour cream and served in paprika sauce (this sauce is everywhere here, and no, it’s not spicy). Lesco – sausage, onions & other veggie bits all mixed together… kinda like a Hunagrian ratatouille. 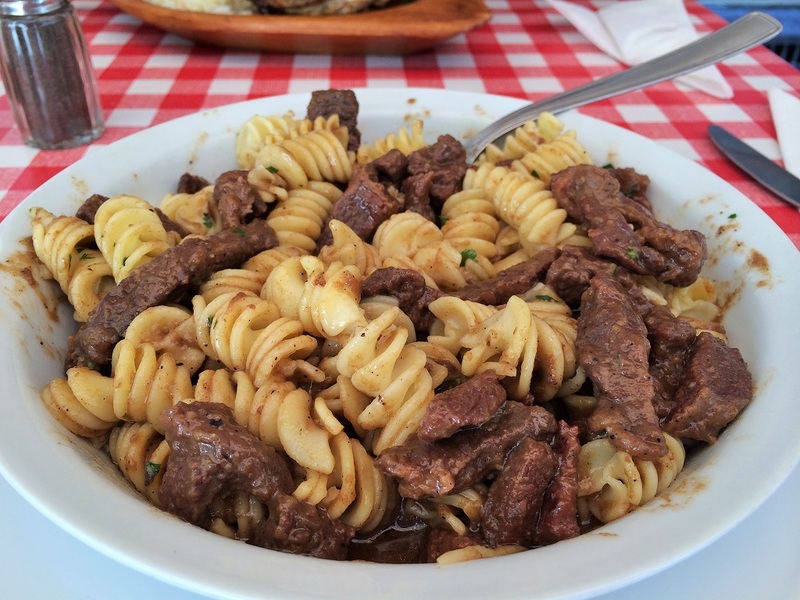 Beef with noodles – the most tender strips of beef and fatty juices over swirly pasta. Sooo full of flavor that I’m STILL dreaming of this dish! This was a special of the day and not in on the regular menu so make sure you ask for the specials! Roasted duck leg – YUM! Duck is very popular here, and they do a really good roast here in this part of the world. Broccoli stew – I saw people at the table next door get this, and it looked so good that I got it the next time. And plus, I convinced myself that I was being healthier by eating veggies (notice how nothing contains greens?). You can add things on top; I asked for a fried egg. Dessert: blackberry dumplings – fluffy pieces of golden fried dough filled with blackberries, and swimming in a rich vanilla cream. This is a popular dessert, but not my favorite since I’m not a fan of donuts (I know… who doesn’t like donuts?!). Most dishes run from 1200-1500 Ft , which is roughly US$5-$7. 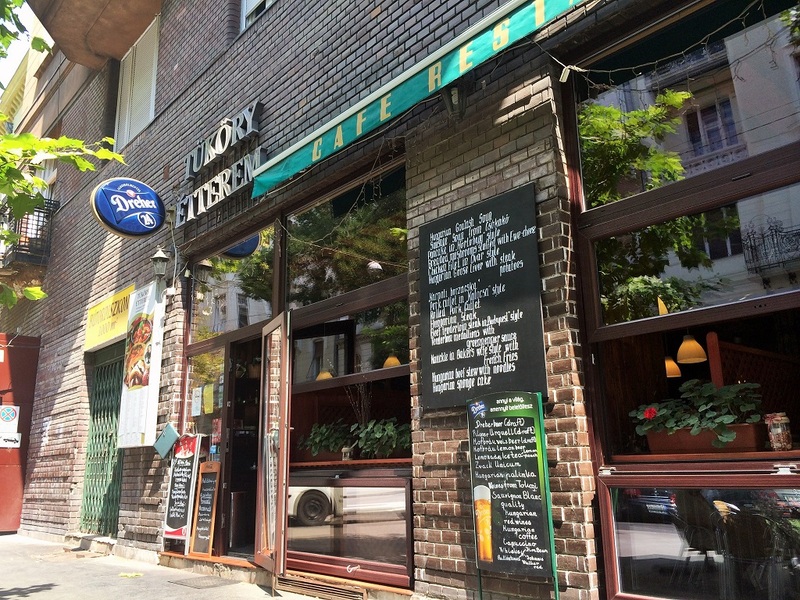 This was, without a doubt, our absolute favorite Hungarian restaurant! It’s a few blocks off the popular streets in the town center, but in my opinion, so worth the walk! Our apartment was right around the block and we came here every. single. day. No joke. Wooden platter for 2 – a little of everything, including breaded mushrooms, chicken cordon bleu, pork steak, and bacon. And of course buttered rice and fries. We couldn’t finish and took home leftovers. 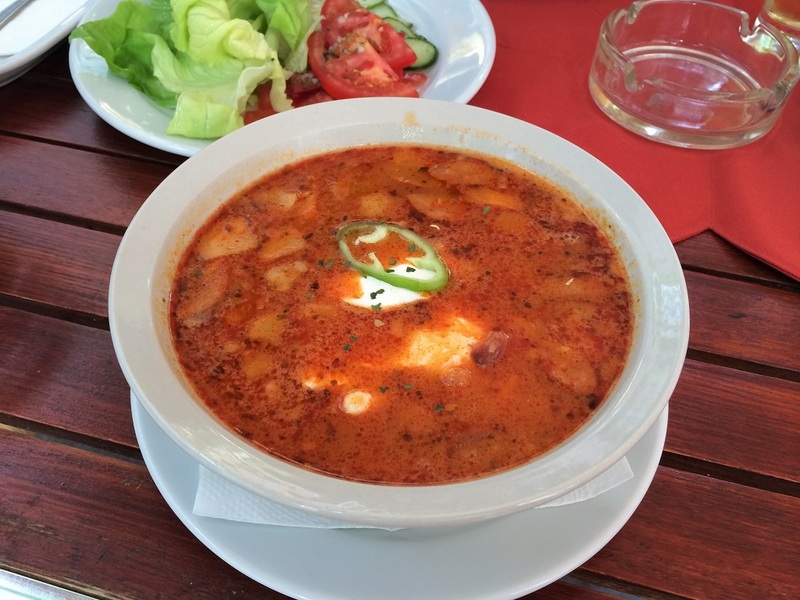 Hungarian sausage soup – a restaurant specialty: paprika based soup with sausage pieces, a generous dollop of cream, and the cincher: a pickled, poached egg. If you’ve never had pickled, poached egg before… it’s an acquired taste. I didn’t acquire it. 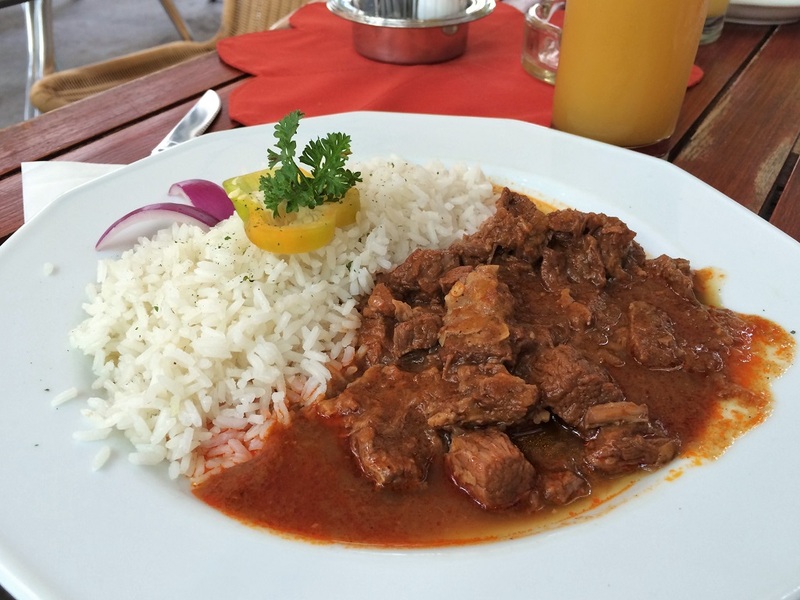 Hungarian beef stew – after trying a variety of dishes, we both decided that we liked the beef stew the best. The meat is always unbelievably tender and the stew so greasy and fatty with flavor. This is where our experiment with different Hungarian dishes end! 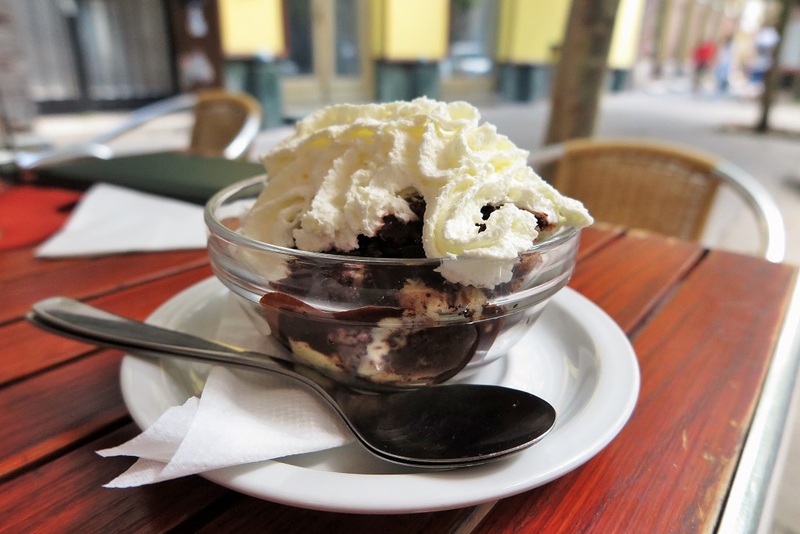 Dessert: Hungarian sponge cake – any plans for weight control was all over after we discovered this. We always ended our meals here with a shared cake – the fluffiest sponge cake soaked with a rum-like juice, layered with custard, drizzled with a chocolate sauce, and topped with fresh whipped cream. Sooo heavenly! Prices here are about 1500 Ft a plate, and more for add-on sides. But to give you an idea, we always walked out of here for under US$26, and that’s with 2 drinks, 1 salad, 2 stews, 1 dessert, and tip. This little shop is located by Kisharang and we always stopped to admire their window display of tantalizing little open-faced sandwiches (kinda like crostinis). Finally we went in one day, and since then it was our go-to place for a snack. There must be over a dozen different kinds, from goat cheese to mushroom cream to caviar. Each one only cost around US$1. The perfect in-between-meals snack or breakfast! I’m seriously drooling as I review these pictures (note to self: don’t edit pictures while hungry), and am also missing the food terribly. Hungarian cuisine has been one of my favorites so far in this Europe tour, and definitely a reason why I left a little bit of my heart in Budapest. But it’s a fair exchange, for I took away with me a truckload of memories and an extra couple of inches on my waist and thighs. 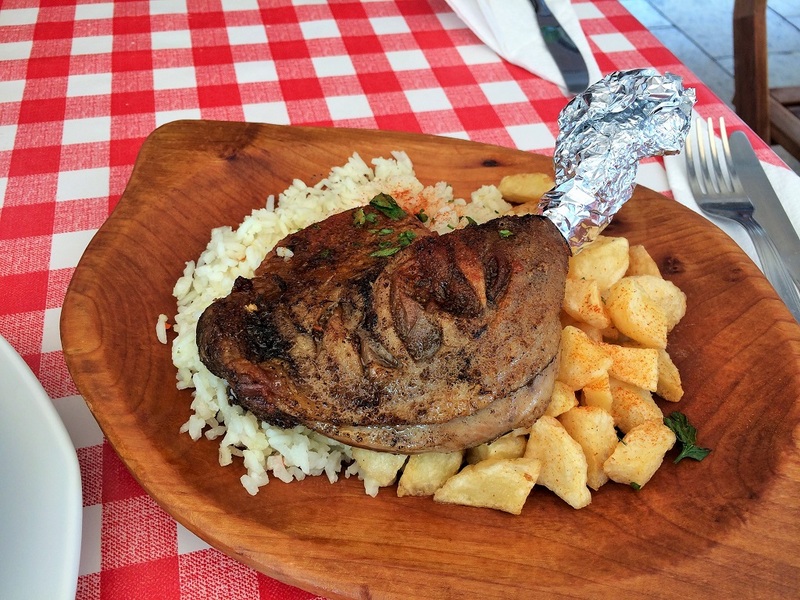 Have you had Hungarian food? Did I miss a specialty that I should have had? Which of these looked most delicious to you? Holy wow. There is a puddle of drool on my keyboard now. Seriously… I was drooling while editing the pics too. Sigh… I miss the food! Wow.. good luck. I could never have a meatless week! Hehe I swear once upon a time, I liked donuts. But then we had a neighbor who owned a donut shop and gave us a box of donuts every single day. I can’t eat another donut since then! Everything looks so yummy! I am an international teacher and I will be going to Hungary with a group of middle + high school students next summer as part of an Eastern European tour. I hope they will all be adventurous eaters and take advantage of Hungary’s culinary delights! Oh nice!! I hope you guys check out some of these dishes!! 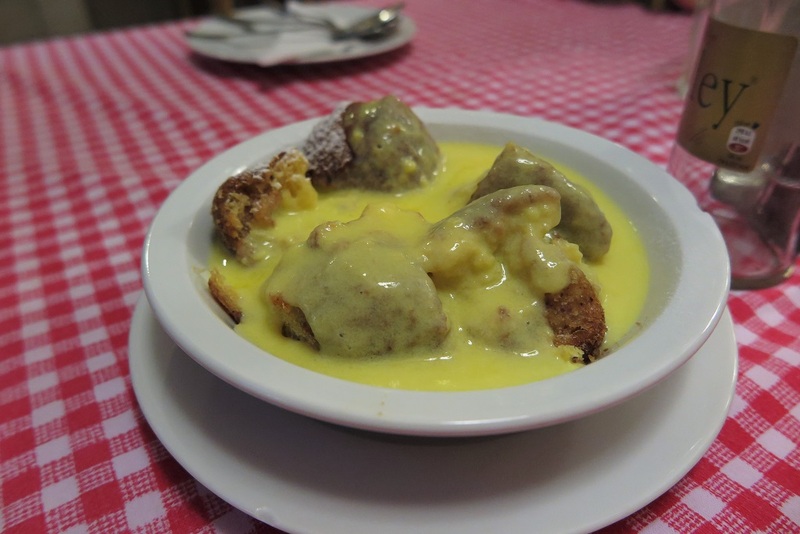 If you like hearty stew-y dishes, you’ll love Hungarian food! I haven’t heard of either of these restaurants but they certainly do look authentic. I’ll go check them out next time! I actually don’t like goulash. The beef stew is where it’s at, but I prefer mine with barley on the side. I love love the roasted duck. It was kinda like the Chinese roasted duck that I missed sometimes. Roasted goose is pretty good. If you missed anything it might have been goose liver or just liver in general. Hungarians go gaga over that stuff. I don’t like it so I don’t blame you! And langos which is super oily and gross, but too good. Gahhh I miss Hungary! We saw goose liver everywhere, but it was kinda expensive so we never got it. But! We did finally have it here in Czech Republic! We got langos once from the street cart, and I thought it was exactly like the Chinese fried dough (yuo tiao), hehe. Mmmmm haven’t had goose yet, but I’d love to try that. I really love the food there too!! Oooh, that food looks so good! Gives me a great excuse to return to Budapest! It was all (well, mostly all) so delicious! I hope you had good food too when you were in Budapest! Now I am kind of sad I skipped out on Budapest when I was in Vienna (I had a cold which severely limited my activities). What a delicious post Anna! Everything looks absolutely heavenly! 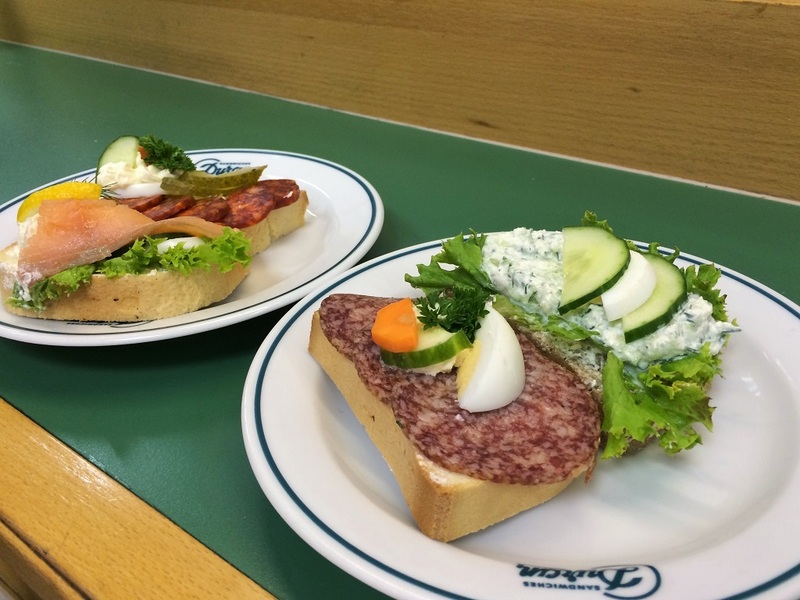 It’s definitely not for the calorie-conscious, but Eastern European food is oh-so-good! 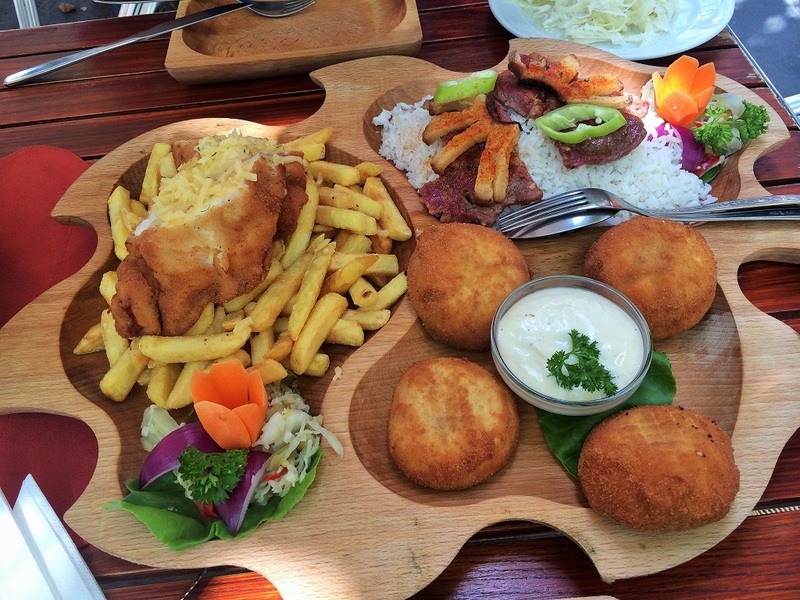 I’d love to visit Budapest one day; if all the food is like this! 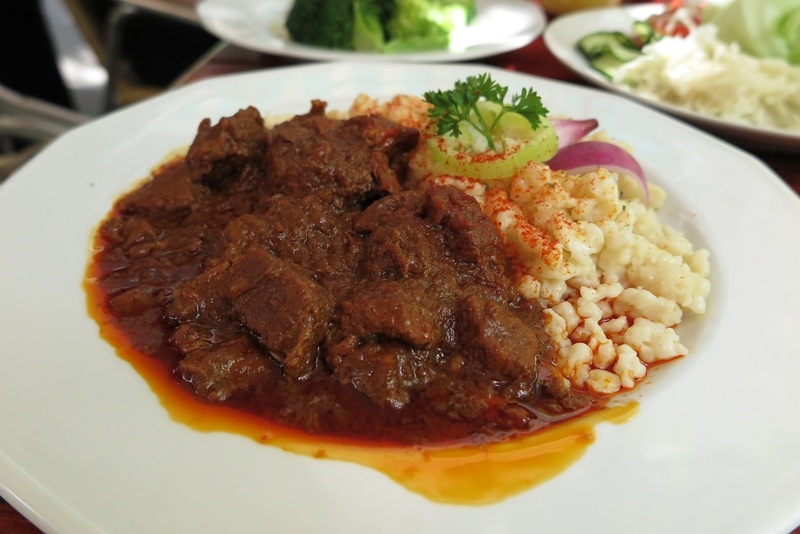 That Beef Stew… I Want! 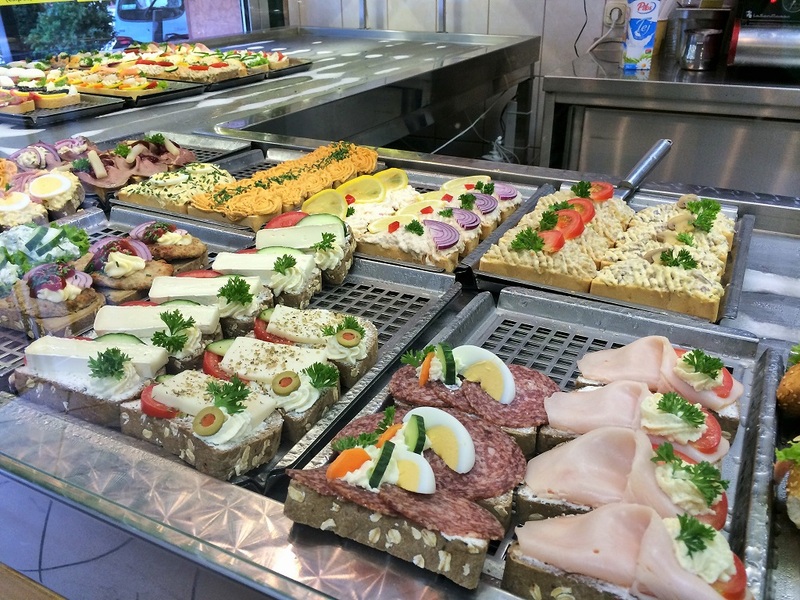 I’ve discovered that none of Eastern Europe is good for the calorie-conscious or vegetarians, lol! But it’s all so yummy. And yes that beef stew is soooo good. I miss it!! 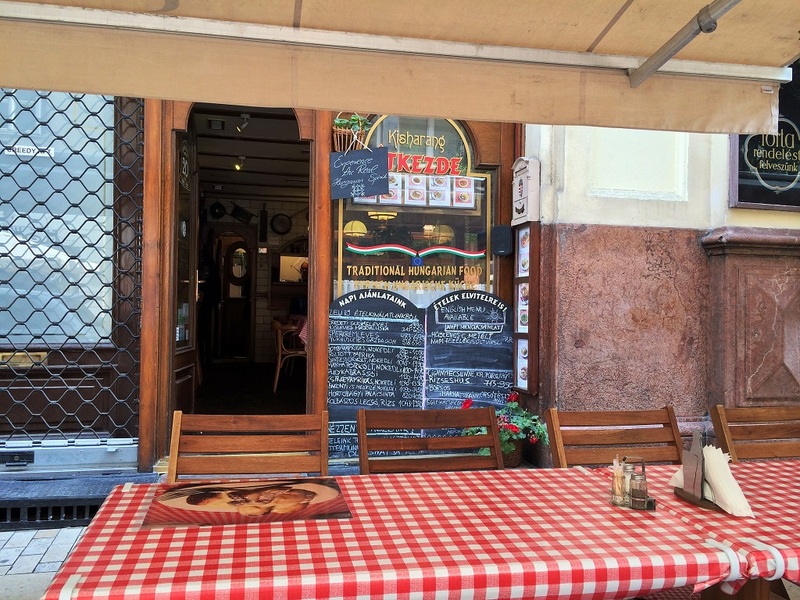 We did come across some very expensive restaurants… yikes! So I was super happy to find these reasonably priced ones :). The crepes were good, but for me, it was the beef stew and sponge cake! 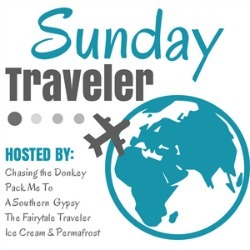 Hello, on behalf of Christa, host of The Sunday Traveler, I was stopping by to check out your article. Oh my, oh my… My hubs and I are total foodies. 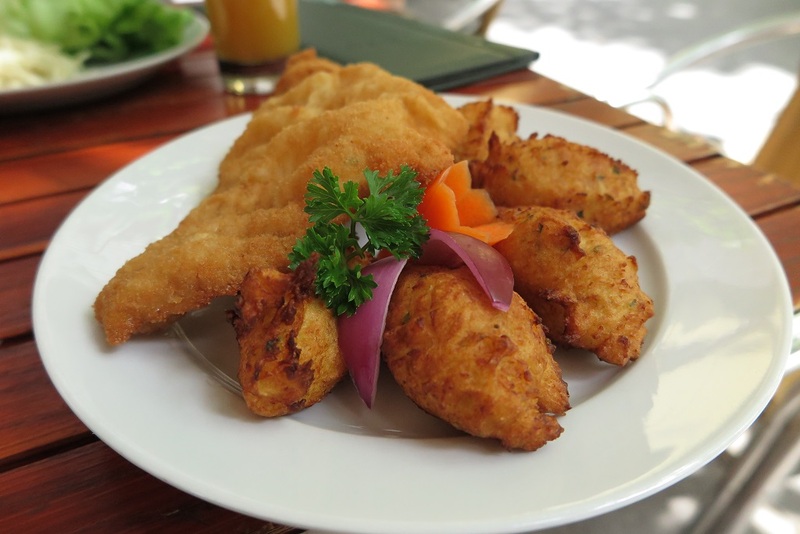 This whole article looked divine but I would take an order of : Wooden Platter for 2, Chicken and Potato Croquettes, Hungarian Beef Stew, Stuffed Crepes and Blackberry Dumplings followed by Hungarian Sponge Cake any day of the week if any way permissible. Yes please! Yum!